Explore southern Africa from Cape Town to the Victoria Falls, travelling in a rugged overland truck and staying in rest camps & chalets overnight. 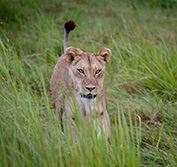 Highlights include the Fish River Canyon, the sand dunes of Sossusvlei and Etosha Game Reserve in Namibia; and the Okavango Delta and Chobe in Botswana. Group size 4 to 18. Activity package included. Camping option also available. You will be met at Cape Town Airport and transferred to your hotel in this beautiful city, within sight of Table Mountain. Check in and relax in your magnificent surroundings. This morning you will be transferred from your Cape Town hotel to the departure point for your group adventure tour, travelling in a rugged 4x4 overland truck. We make a last photo stop to look back at Table Mountain from across Table Bay, before travelling to the famous winelands region of the Western Cape to enjoy a wine tasting at a local wine farms. We then travel through farmlands towards the Piekenierskloof Pass, on our way to the Cederberg Mountains. No road trip is complete without a stop at a traditional Padstal - one of the small farm stalls that dot the byways of South Africa and offers a variety of homemade treats and bakes. The Cederberg region not only boasts spectacular mountains and orange farms, but it is also the home of the Rooibos tea bush. Indigenous to the mountain slopes of the Cederberg, this herbal beverage has earned an international reputation as a healthy and refreshing alternative to regular tea. A traditional dinner at our overnight stop offers an opportunity for us to get acquainted, while enjoying some South African hospitality. Regardless of lodge meal plans, all your meals are included whilst on tour and will be prepared & served from the overland vehicle - except for specified optional dinners in cities. Alcohol is not included. Accommodation varies and includes lodges, hotels, hostels, chalets, permanent tented camps and traditional huts. Bedding is provided, but you do need to bring your own towel. Truck lockers are 30 x 80cm, so please use soft bags that will fit (but there is no weight restriction). Please be aware that accommodation sometimes has to be substituted for operational reasons. Today we travel through the Northern Cape to Namaqualand, which presents us with our first experience of the desert vistas that will accompany us in the days ahead. We continue our journey north and after a short stop for supplies in the small town of Springbok, best known for its diamonds, copper and spring flowers, we travel to our camp on the banks of the Orange River that forms the natural border between South Africa and Namibia. If you are fortunate enough to be travelling in the spring months (July to September) you may encounter the wild flowers that have made this region famous. No matter the time of year though, the strange desert vistas offer a unique backdrop to today's travels. While the Orange River was named after the Dutch royal house, in recent times it has been referred to by its original name of Gariep, which simply means “river” in the indigenous Khoisan language. Beginning its journey in the mountains of Lesotho the Orange River is the longest river in South Africa and offers a unique contrast to the desert landscapes along its banks. The best way to experience the river is by getting out on the water and this morning we have the opportunity to join an optional canoe trip on the river. Later this morning we cross the border into Namibia and travel onwards to the Fish River Canyon, one of the largest in the world. This afternoon we take a walk along the rim of the canyon. We overnight at the hot springs of Ai-Ais and this evening we indulge in a hot water swim under the desert skies. Every overland journey has some long travelling days and today is one of those as we venture deeper into the Namib Desert, the oldest desert on earth where some of the highest sand dunes in the world stand towering over the white desert plains. These great mountains of sand are a monument to the extreme forces of nature, with fog supplying life giving moisture for the survival of its plants and animals. Our destination is the dune fields that cover the western reaches of the desert. Long dusty roads and sparsely populated farmlands offer us an insight into the vastness of rural Namibia. From the grasslands in the east to the red dunes of the west the slowly changing landscapes represents the many faces of this desert country. Watching the sunrise over the red dunes is an iconic highlight of any trip to Namibia and this morning we rise before the sun to capture this magnificent moment. A brisk climb up Dune 45 offers us the perfect vantage point to marvel at the changing colours of the desert sunrise. Once satisfied we descend this famous dune and enjoy a hearty breakfast before catching a 4×4 transfer into Sossusvlei, where we spend time on foot visiting the pans at Sossusvlei and Deadvlei. A last stop at the Sesriem Canyon will end our visit to the dune fields, but our day in the desert continues this afternoon as we join a local expert for an educational desert excursion. Tonight we empty the red sand from our shoes and enjoy the magnificent desert stars, knowing that we have spent a full-day enjoying the wonders of this harsh land. Today we continue west and make our way to the coastal town of Swakopmund, where adventure and a dose of civilisation awaits. Reluctantly we leave the Namib behind and after a stop to mark our crossing of the Tropic of Capricorn, we continue to the Atlantic coastline. We make a brief stop at the Walvis Bay lagoon, where we hope to catch a glimpse of the flamingos that feed in the shallows. Arriving in Swakopmund we will have the opportunity to book some of the many optional adventures on offer. Swakopmund is situated on the Atlantic Coast where the cold Benguela Current sweeps up from Antarctica, releasing no moisture into the prevailingly onshore winds – hence the very low rainfall and desert conditions. Fog is common along the coast in the early mornings and late afternoons and this is what gives life to the desert-adapted flora and fauna of the region. The cold current is also highly oxygenated, causing it to teem with marine life. We enjoy an optional dinner out at a local restaurant tonight. Dinner is not included this evening, as there is the option of dining out. At leisure to relax and explore the beach resort of Swakopmund. While for many it is the adrenaline fuelled adventures that will grab their attention, Swakopmund offers all that and more. Take the opportunity today to explore the town at your leisure, as there are a number of attractions for every taste, including optional quad biking, sandboarding, sky diving or dolphin cruise. Not to be missed is the selection of famed coffee shops and bakeries that offer a delightful range of German inspired treats. Swakopmund offers all the conveniences of a small city and is the perfect launching pad for the journey through the northern reaches of this land. Lunch & dinner are not included today, as there are many restaurants in Swakopmund for you to enjoy. This morning we travel a section of the famous Skeleton Coast road. We pass the salt works and head north for a photo opportunity in the colourful town of Wlotskasbaken. Lichens are one of the most fascinating examples of symbiosis in nature, as algae and fungi unite to form the lichen and live inseparably as one organism. We will have the opportunity to view these fascinating desert inhabitants before turning east towards Spitzkoppe. These massive granite formations tower 700 metres above the desert plains below and the presence of rock art indicates their significance to the San Bushmen people who lived here many years ago. We will enjoy a late afternoon walk with a local guide and have the opportunity to view some examples of San rock art, before completing the journey to our overnight stop at Khorixas. We continue north this morning to Kaokoland and on our way we visit a project that will introduce us to the Himba people of northern Namibia. The semi-nomadic Himba Tribe are extremely susceptible to western influences and have lost a large portion of their land to farmers, engineers and miners. Many were also displaced during the wars that raged between Namibia and Angola. The dwindling number of pastoralists that still exist in their natural environment are protected as far as possible by creating a “buffer zone”, or “educational tribe”, where tourists who would like to get a better understanding of the lifestyle of the Himba and their traditions, can do so without interfering with those still living in their natural environment. Visiting the Himba tribe can be a controversial topic that gets discussed around the camp fire, however not so much if the reason for visiting this particular tribe is understood beforehand. The income that this specific tribe generates from the visits goes towards the education of orphaned Himba children and assists the tribe in giving them a chance to learn about their own culture and heritage. There is a market at the end of your visit, this is a way for the women to establish a small income, used for their own private expenses, and it is up to you whether you’d like to purchase anything or not. We continue to Opuwo for overnight and prepare for two magical days of game viewing in Etosha National Park. Rising early this morning for our drive to Etosha National Park, the venue for some of the most unique game viewing experiences in Africa. Etosha owes its unique landscape to a vast shallow depression – the Etosha Pan. During the dry season it becomes an expanse of white cracked mud, shimmering with mirages and spiralling dust devils, with its open pans offering magnificent game viewing. Etosha is home to over a hundred different species of mammals, including cheetah, leopard, lion, elephant, rhino, giraffe, zebra and wildebeest. Today we have a full-day to explore the edges of Etosha Pan in search of the abundant wildlife that occurs in the park. Our truck offers us an elevated platform and we will spend some time at the many waterholes dotted throughout the park. Evenings in Etosha are best spent wrapped up warmly at the floodlit waterholes at the rest camp. Those who wish to partake in an optional night drive may do so tonight. Our second day in Etosha National Park allows another full day to continue our exploration of the park - one of the largest wildlife conservation areas in Africa, surrounding an enormous salt pan that is the size of the Netherlands. No day on safari is ever the same and the suspense before that special sighting is the motivation that keeps our eyes wide open. The vast Etosha Pan offers magnificent game viewing opportunities including springbok, oryx and black-faced impala. A series of waterholes throughout the park and at your rest camp guarantees rewarding game viewing, with Etosha being renowned for its vast arrays of plains game and its “great cats” which are more easily seen on the open pans. Etosha is also a bird watchers paradise, with hundreds of recorded bird species and many migrants during the summer months. At the end of the day we leave Etosha National Park and drive to Outjo. In the evening, enjoy the balmy weather and pristine stars of the Southern Sky and Milky Way, as you have never seen them before – including the spectacular Southern Cross. Today we leave Outjo and travel 3.5-hours to Windhoek, the capital city of Namibia. We make a brief stop at the craft markets of Okahandja, before arriving in Windhoek. We take a short walk through the city centre and have the opportunity to view some of its better known landmarks. Tonight we have the option to dine together at Windhoek’s most famous eatery, Joe’s Beer House, which has gained a reputation for its venison dishes and quirky atmosphere. Today we travel east and make our way to neighbouring Botswana and the Kalahari Desert. Starkly different to the Namib Desert, after which Namibia is named, the Kalahari is no less dramatic and covers over 900,000 square kilometres. The San people have long been associated with this harsh environment and tonight we enjoy a dance evening that provides an insight into their culture of song, dance and story-telling. The San Bushmen have existed in some of the harshest conditions for thousands of years and this morning you will have the opportunity of joining an optional walk with San guides to learn how they embrace the environment to survive. This afternoon we journey to Maun - the gateway to the Okavango Delta. Your guide will brief you on what to pack for our Okavango Delta excursion (a small daypack or overnight bag will be needed, due to space restrictions on our transfers to and from camp). This morning we transfer to Maun Airport for our light aircraft flight into the Okavango Delta. This unique and unusual ecosystem sees the annual flood waters of the Okavango River fan out into the sands of the Kalahari Basin – never finding the sea, but instead forming a great inland delta whose waters are absorbed by the desert.. The seasonality of the flood waters lends the Delta its ever changing character. While water levels may fluctuate the tranquillity of this wilderness area remains constant. Comprising 6,000 square miles of crystal clear channels, serene lagoons and a myriad of islands, the Okavango Delta forms a natural oasis that sustains a vast variety of wildlife and birds of all descriptions. The waters are at their height from July to October, forming an amazing wetlands ecosystem that is one of the greatest natural wonders of the world. A full day is set aside to enjoy the activities on offer in the Okavango Delta. While the programme of activities is flexible to accommodate the seasonal changes, you will have the opportunity to enjoy amongst other activities traditional mokoro rides and natures walks. The Okavango Delta is not only a natural wonder, but represents one of the last great wilderness areas in the world today. Leaving the Okavango Delta behind, we touch down in Maun this morning and reunite with our truck. Our journey today takes us across the northern reaches of the Makgadigadi Pans. These white shimmering pans are one of the largest salt flats on earth, covering over 6,000 sq.miles (16,000 sq.km) - with some covered in water during the wet season. The road to Nata is lined with majestic baobab trees and we will catch glimpses of the extensive pans that stretch out to the south. As a portion of our route bisects the Nxai Pan and Makgadigadi National Parks, if we are fortunate we may see some of the wildlife that roams this vast protected area. We rise early this morning as we continue travelling north to our lodge on the banks of the Chobe River. This afternoon is set aside for exploring Chobe National Park, uniquely situated at the confluence of the Zambezi and Chobe Rivers where four African countries meet – Botswana, Namibia, Zimbabwe and Zambia. This is Botswana’s premier wildlife reserve, surrounded by vast endless landscapes, open plains, baobab trees and the abundant river-based wildlife of Chobe. We begin our exploration in 4×4 vehicles, which allows us an up close and personal experience with the many elephants that frequent the river. In the late afternoon a special highlight is a game viewing sunset cruise on the Chobe River. With the memories of our wildlife encounters firmly etched in our minds, we cross the border into Zimbabwe this morning and travel the short distance to Victoria Falls, known locallys as “Mosi-oa Tunya”. We enter Victoria Falls National Park and view the magnificent “Mosi-oa Tunya” - Smoke That Thunders - first discovered by Dr. David Livingstone and still one of the greatest natural wonders of the world. The flow of water over the falls is greatest from February to June following the summer rains, but they are a magnificent sight at any time of year. While much of today is dedicated to viewing the mighty Zambezi River as it drops into the Batoka Gorge below, the bustling adventure town of Victoria Falls also offers a range of optional activities for those wanting a dose of adrenaline in the afternoon. For the more relaxed traveller there are craft markets and coffee shops on offer as well. Tonight we enjoy an optional dinner out. Dinner is not included at Victoria Falls, as there is the option of dining out. Today is free to relax at Victoria Falls after the end of your tour. Many optional activities are available including a Sunset Cruise on the Zambezi River where you may see hippos, crocodiles and abundant bird life; a helicopter flight over the falls and an elephant interaction. Transfer to Victoria Falls Airport for your flight home.